I’m already so in love with Goblin it’s not funny, and definitely the recipe for heartbreak and tears down the road with how dark and beautifully moody the story construct is. The drama doesn’t have the hallmarks or feel of a Kim Eun Sook drama at all, even the quippy dialogue is kept to a minimum as the words are few but the meaning deep or sorrowful. It’s like Kim Eun Sook, who I have nearly always liked, evolved herself finally and broke through to a new level. 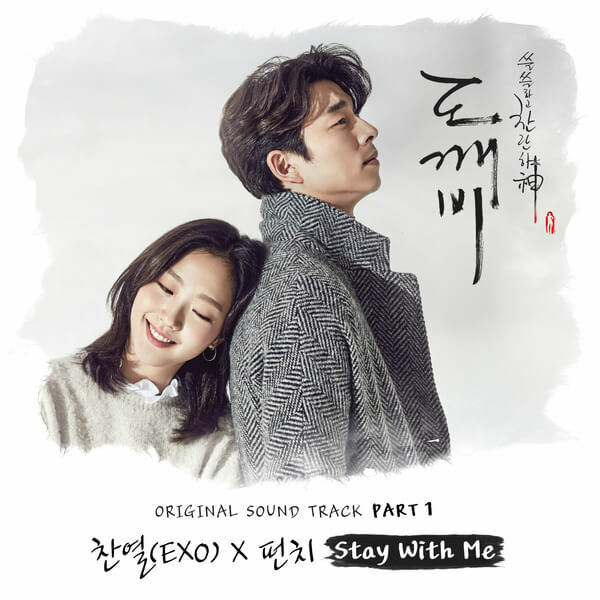 What is a hallmark of her dramas in the addicting and sprawling soundtrack remains judging by the first track to drop “Stay with Me” by Punch featuring Chanyeol of EXO. Punch has been a drama fave of mine after she did “First Love” with Tiger JK for Pinocchio, but it’s the EXO boys who continue to impress after Chen’s “Best Luck” in It’s Okay, It’s Love. I haven’t watched it yet, because I am going to spend my sunday watching the two episodes back to back. After Shopping King Louie ended I haven’t yet started a new drama and I really need something new right now. Completely in love with this drama, just watched 2nd episode and just was wishing why Friday was not tomorrow. Is true is does not feel hallmark to me either the cinematography is beautiful and the editing is on point, the agle of the scene are well done. I’m ready for the Rollercoaster of emotions that I will feel and the tears but not afraid of the ending regardless if it is happy or sad because regardless the ending I think the story will be playout in away that will bring closure not like another drama I saw earlier this year. So far also in love with the music, is not loud at some point lovely. same i had to check again that kES wrote this…..LOTBS feels like her work moRe than this lol. It’s so good tho….addicting and so stunning. just started and it definitely is going great! the korean songs are great but the english songs are a little off. the storyline is very unique. i feel like gong yoo’s character is the human version of howl in howl’s moving castle! love it! The part where he wrecks the ship i n Ep 1 is like a page from the wizard of earthsea. also, I ship LDW and GY. lol they have amazing chemistry in this drama!!! I love the drama and the OST is really, really good. I think Punch is making her way through the EXO boys. Next I hope she sings with Baekhyun. Well, You should praise the PD first… He brought this drama to a new level. does anyone happen to know if the background music can be searched? does it constitute part of the OST? or is it just… unidentified background music? Usually all the background music will be released as part of the OST after the drama ends. You can search for it then. Actually to me, it does feel like a Kim Eun Sook drama (it greatly reminds me of that fantasy atmosphere in Secret Garden (only a bit darker); not to mention the rain/thunder/clouds motive. The major difference is the director. He is a genius, really: there was that scene in the second episode where the goblin tries to pluck the sword out of his chest. It was simply breathtaking. Or those scenes among the tombs… He’s officially my favourite director. Loving the show so far! Though is it just me or does the opening sequence of the song sound like the Chainsmokers “Don’t let me down”? Guys have you realized that at the end of ep 2 the lyrics of stay with me sound different from the one they released it’s sound some thing like this “so many painful memories I erased you your love hurts I erased everything my love you can throw me away but…” up to here I could translate it you can go back to the end of the ep just before the credits has anyone noticed?? and why haven’t the relished this song as part of the oat album?? Yeah, i noticed that since ep 1 (I’m listening to the song first then decide to watch the drama). That stay with me we could see (download) everywhere use different lyric with the one we listen when the drama end. I’ve searched everywhere for that ver but couldn’t find it 🙁 Haven’t anyone else realized that too? The ost has the same beginning as the Chainsmokers “Don’t let me down” featuring Daya. So who sampled from whom? Who was the original?